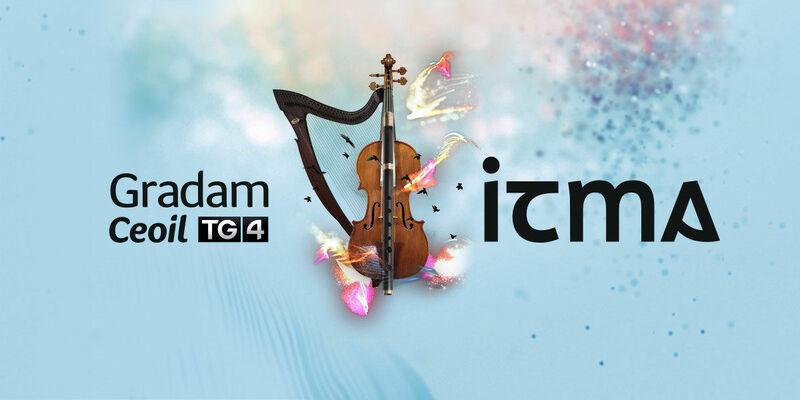 This year TG4 made available online the annual TG4 Gradam Ceoil award ceremonies since 1998 with ITMA identifying the names of all the tunes, songs, and performers featured in each programme. The result of our collaborative archiving efforts Cartlann Ghradam Ceoil was launched at the Willie Clancy Summer School 2018 by Cathal Goan former Director of TG4 and former Chairperson of ITMA. Logo for TG4 and ITMA's collaborative digital archiving project: Cartlann Ghradam Ceoil. Irish-language broadcasters TG4 knew that they were sitting on a treasure trove of traditional music in the annual Gradam Ceoil concerts. Running since 1998 and now a highlight of the broadcasting schedule, these annual awards programmes are a valuable (re)source for tunes, songs, and unique performances. The nature of live television and the packed schedules of the concerts means that performers only rarely have a chance to tell the audience what they are planning to play. The presenter sometimes does it for them, but more often than not introductions take the form of a generic “dreas ríleanna” (“a selection of reels”). The presenters often identify the performers, but individual band members are not named. In other words, there were major information gaps that made accessing the contents of the broadcasts challenging. This is where ITMA came in. We were tasked with taking all 21 years of TG4 Gradam Ceoil award ceremonies and identifying every tune, every song, every instrument, and every performer. 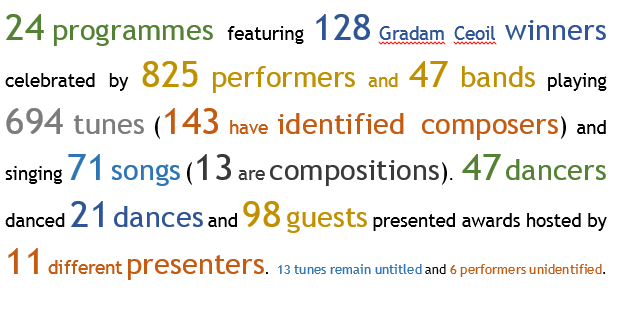 21 years of TG4 Gradam Ceoil in numbers. Together these numbers demonstrate the breadth and depth of this unique archival resource. As ITMA’s melodies officer, it became my job to listen, watch, identify, and document the performances. And the music is of the finest quality. It was “work” that I couldn't help but enjoy! My tools for this task were ITMA’s own extensive catalogue: each recording and book at ITMA is catalogued to the level of tune or song. With this resource I was able to find the relevant tune in a book or on a recording. Then I looked at or listened to the physical item in the ITMA catalogue to match it to the tune or song I was identifying. A selection of Gradam Ceoil records from ITMA's catalogues. My own musical knowledge and my fluency in Irish were integral to this project. But I also relied heavily on the TunePal app developed by Dr. Bryan Duggan. This app allows you to play a few bars of a tune into your phone and then it tells you what it is called. It also identifies the names of similar tunes if an exact match isn’t found. In other words, it is Shazam for Irish traditional music. Port, ITMA’s own tune resource. Logos for TunePal and Port, ITMA's tune resource. I’m not one of those musicians who can tell you the name of a tune that was just played in a session, even if I just played it myself. Most of the time, I didn’t know the name of the tune I was listening to off-hand. TunePal became my best friend. If I knew the tune, it was easy to play it into TunePal on the tin whistle and then use the name that TunePal gave me as a starting point. If I didn’t know the tune, I listened to it a few times and tried to pick it up by ear. Then I played an approximation of it into TunePal to get started. This methodology served me well for about three quarters of the material. Tunes often have multiple names—a topic that is a subject for another blog!—so I worked to confirm that the titles and tunes matched up and that I was using a well-known title for each tune. I also checked to find out if the performer had a commercially recorded version of the tune they performed for the Gradam Ceoil awards ceremony; using their published title was my preference. For performers, the Gradam Ceoil was a very important gig. It was often the case that they chose to play tracks that were well practiced and highly polished. If it transpired that the tune was a composition, the composer was listed alongside the tune name. The songs weren’t as difficult to identify. More often than not the song was introduced with the performer. Titles of traditional songs are usually present in the first line or a line in the chorus. Listening to the words enabled me to make a guess at a possible title that I could then confirm using ITMA’s resources. After the first pass, a significant amount of information—what librarians and archivists call “metadata”—was available for each Gradam Ceoil concert. An example of the detailed metadata generated by ITMA. if they remembered who had been on the stage with them. As often happens with these projects, the deadline was looming and there was still lots to do. It was time for the big guns. Jackie Small, who many will know as a ‘tunologist’ of note, and my ITMA colleagues Dr Lynnsey Weissenberger, Brian Doyle, Alan Woods and Maeve Gebruers listened to the last batch of unidentified tunes and between us we were able to identify most of them. People were very generous with their time and knowledge and my thanks to all who contributed in this way. I made a few trips to the TG4 offices in Baile na hAbhann to assist with inputting the data into their own systems, as this provides the technical back-end to the TG4-ITMA collaborative website. Most of this work was done by Sinéad Ní Ráinne and her excellent team at Europus. They even managed to fill in a few blanks for me as they worked! Better than a Netflix binge for traditional musicians! The website is now live and all the information that we gathered is there for everyone to use. Over the 20 years that the Gradam Ceoil ceremony has broadcast, there have been approximately 800 performers involved and over 700 songs and tunes performed. All performers that can be seen on stage are identified, and there are only 13 tunes left nameless. There may be mistakes—I’m sure there are!—and I welcome any feedback. I would also love to know the names of the outstanding tunes or people if anyone out there can help. I hope viewers of the material get as much enjoyment out of watching the performances and using the data as I got out of its creation. A screen shot of the user interface for the Cartlann Ghradam Ceoil website. Visit the site now.